Today, we’re excited to announce the release of the SquadUP mobile app – totally free – and available in the iTunes app store now! It’s the first ever mobile event planning app that lets you plan as you go, right from your mobile phone. SquadUP isn’t just about creating an event anymore. It’s about sharing an experience. The good folks at Pando Daily wrote an article covering the SquadUP mobile app today! It’s a great sign that Pando recognizes the importance of being a mobile first platform in the event space and that SquadUP is leading the charge. Check out the article! 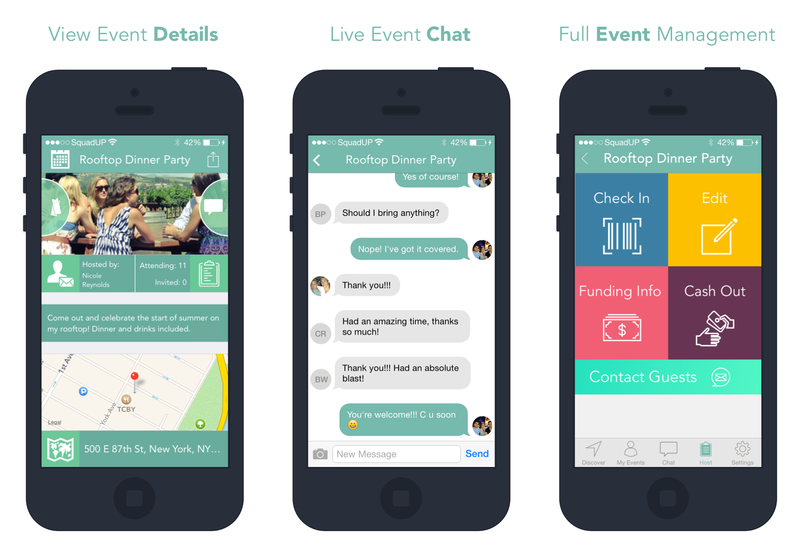 With SquadUP, you can create events from your phone and invite guests on the spot. Manage ticket sales, mobile check-in and registration. Access all of your SquadUP events — past and present — as well as the ability to discover featured events by interest, location, event name or host. The new messaging feature lets you chat with your invitees before, during and after the event. Attendees can share pictures and messages with one another, too, without exchanging personal contact information. It’s a super social way for your guests not only to keep in contact with you, but to serendipitously meet new friends, also. In just the first week of beta testing, the chat stands out as a game changing feature, drastically increasing guest engagement. Think of it as your own personal “flash network”. What does CEO, Willie Litvack have to say about all this? By doing this, we’re able to follow our users from the initiation of the event on customized event pages all the way through to the live experience– and even post-event where guests can look back at the photo and video galleries. So, what do you think about SquadUP mobile? Send us your feedback and don’t forget to give us some ratings love, too! Austen is Co-Founder / VP of Marketing at SquadUP, focusing on digital strategy, branding, community building, and managing the 500+ students in the SquadUP Brand Ambassador Program across campuses nationwide. He is a data driven growth hacker.